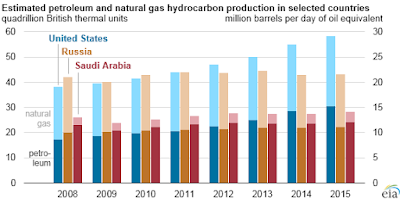 While trying to lead climate change fight, U.S. ... leads global fossil fuels production race? While trying to lead climate change fight, U.S. ... leads global fossil fuels production race? While trying to lead climate change fight, U.S. ... leads global fossil fuels production race? 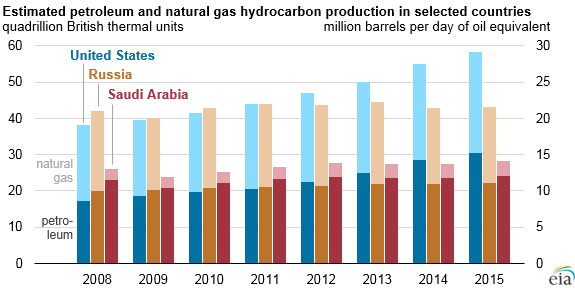 According to the U.S. Energy Information Administration's report, the U.S. surpassed Saudi Arabia and Russia to become the world’s top natural gas producer in 2011, and has led the world in both oil and gas production together for four years in a row. It is happened thanks to the fracking boom, which unlocked previously hard-to-reach shale oil and gas. A crude oil production has continued to grow across the country and almost doubled over last seven years, from nearly 8 million barrels of oil per day in 2008 to about 15 million in 2015. This trend of increasing production and use of fossil fuels definitely contradicts with declared intentions of U.S. administration to lead the world also in combating climate change.